United Cutlery Black Kogane Dynasty Forged Katana Sword Damascus | BUDK.com - Knives & Swords At The Lowest Prices! Only United Cutlery could recreate this breathtaking Gold Kogane Dynasty Forged Damascus Katana in such dramatic detail. From the striking patterns of the heat-forged Damascus steel blade to the gleaming brass accents, this katana abounds with detail and style. The powerful blade bears a laser etching that translates to "United Strong Steel, " evidencing the supreme power of these Damascus blades, each of which is folded nine times to 1792 layers. I bought this on the recent closeout and decided to buy a second one. The first one arrived yesterday. What a beautiful sword. It is bigger than most other swords by a couple of inches. Very nice Damascus steel blade and fairly sharp. Well made and tight fitting. My favorite sword now. I ordered mine and it got here exactly on time. Beautiful sword and I'm very happy with this purchase. Worth the price three fold. Would recomend to purchase for anyone who wants a powerful, usable, and over all wonderful sword. The Best Katana I Own. I bought this on a Closeout sale, but I've gotta say, I would have payed full price easily for this piece after seeing the quality. United Cutlery really doesn't disappoint here: the Damascus-style blade looks fantastic and comes razor sharp, the handle and tsuba are beautifully detailed in rich gold and black, and the scabbard is sturdy wood with a cool design and wrap. I haven't taken it for my usual cutting tests, but I can already tell this one will be a top performer and is easily the best looking katana on my rack. For the price, you really can't do any better. I found absolutely no downsides to this blade, and I highly recommend it. Oh, and thanks to BUDK, it shipped quickly like always. I've bought quite a few swords from True Swords. Most of them are very good. But this one is definitely a leader of the pack. The blade, the scabbard, the feel of the sword in your hand... I can't believe that a sword this great was being sold for that low of a price. The over all appearance of this Shikoto Sword is exstreamly nice! All aspects of fit are very good. I bought this Sword because I like the look of Gold on Black as long as it is tastefully done as on this piece. I got it for it's display Quality and it fits that bill completely. Probably the least important part to most is the wooden sheath but it is the most amazing piece of beautifully finished wood on any sword I own! I question the Damascus blade being real only because my Shinwas are all Damascus and are super smooth, no texture can be felt, none should be. I have Hammer forged steel many times and the surface is always beaten absolutely smooth just like the Shinwas! I don't have any idea where the texture would come from during the forging process and believe it was added after forging. Plus the fact that while most blades are ground to final dimensions the surface would again be smooth! Over all a nice sword though, fitting for a spot on my display shelf! If anyone can fill me in on the texture reasoning if there is one I'd be interested in learning about it! This Katana is far better in my hand, than this photo shows. I very happy with this sword. 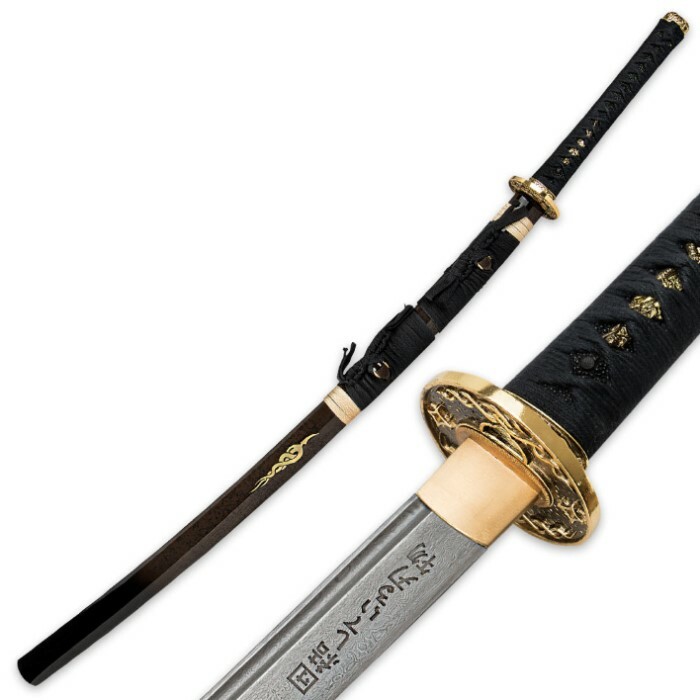 This Katana I recommend , it is worth the price. Absolutely breath taking sword. Damascus blade has a really cool greyish color.. almost looks like titanium.. Black wrappings and gold fittings combination looks AWESOME!!.. 5 STARS ALL THE WAY!! 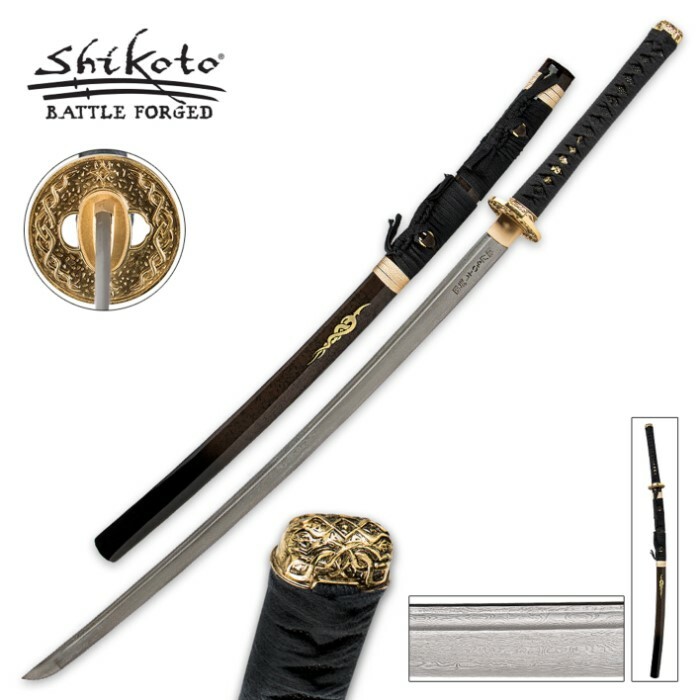 Highly recommend this swords to anyone who likes quality katanas and a absolute must for lovers of the Black/Gold combination.. Good strong sharp and beautiful sword!!.. BUDK IS THE BEST!!! 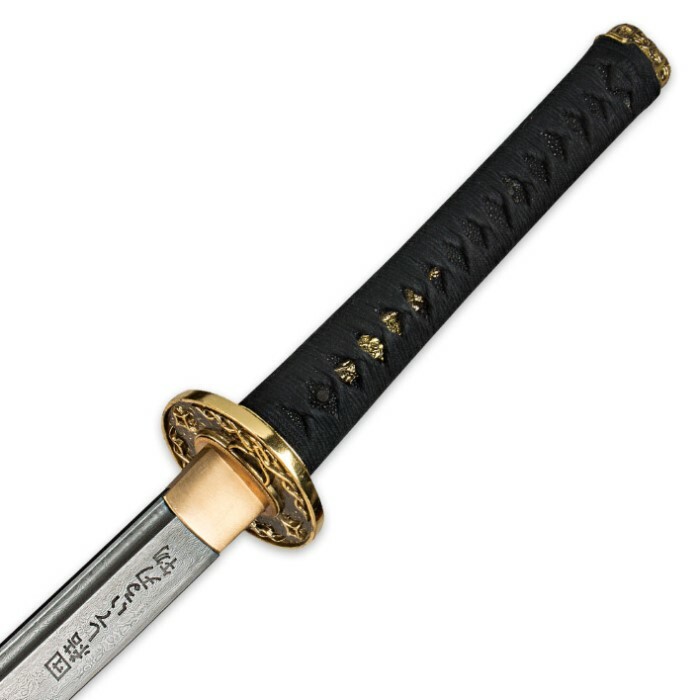 United Black swords are by far the best I've seen in this price range, they are top quality from tip of blade to tang, I disassembled a United sword and two others and showed them to my wife and a friend they were amazed at the difference in the quality. I recommend United swords over all as they compare to any sword that will cost some what more. Lastly the Kanji symbols on the blade says "United Strong Steel". Thank you Daniel of Nebraska.